Many people this time of year jump back on the bandwagon of diet and exercise. At the Dunkirk Animal Clinic we see many pets that are in need of a diet and exercise plan. Below, I am going to discuss ways to help your pet lose weight. Cats can be very difficult to help lose weight and exercise. We start by highly recommending a weight loss diet if your cat is prone to being overweight. The best weight loss foods are those sold at your veterinarian’s office that are designed specifically to be low carbohydrate and low fat. 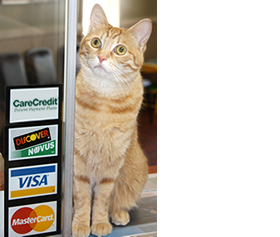 Your veterinarian can help come up with a feeding plan and food that is best for your cat. Be sure you are specifically measuring out the proper amount for your cat. Free feeding only promotes obesity. A sedentary housecat needs only about ¢ to 1 cup of food daily to help meet their caloric needs. If your cat begs for food, measure out their allotted amount each day and only use that amount to give small meals throughout the day. There are also many products sold online that will make your cat work for its food. Putting the food up on a cat tree requires your cat to climb to get to their food. There are also special feeding balls that you can put the cat’s allotted amount of food inside. Only a piece or two of food falls out of the ball at a time as your pet pushes the ball around. I also recommend putting your cat’s food in the opposite end of the house from where your cat sleeps. Some cats will play with toys, especially toys with catnip in them. Make a daily routine to play with your cat to get your cat moving. If your cat remains overweight, it predisposes them to a number of health issues including joint disease, heart disease, and diabetes. Diabetes is one of the most difficult diseases we deal with in veterinary medicine. Treating diabetes requires life-long insulin injection and blood sugar readings. Diabetes significantly shortens your cat’s life, especially if they have trouble regulating their blood sugar readings. Dogs on the other hand are very easy to exercise! Daily walks and playing with toys are much easier to do with a dog than it is to do with a cat. Make a schedule for your overweight dog. Start with short daily walks and increase the distance you walk on a weekly basis. Don’t expect your dog to be able to walk miles right off the bat if they are overweight. If your dog is still having trouble even with short walks, you may want to see your veterinarian to determine if your dog has already developed osteoarthritis. We also recommend a measured amount of prescription weight loss food for your dog to help them lose weight. Talk to your veterinarian about what food and amount would be best for your dog. Treats can be a huge problem when trying to make your dog lose weight. In our office we had a poster that states if a 10-pound pet ate just 1 ounce of cheese, it is equivalent to a human eating two and 1/2 hamburgers or four full chocolate bars! This really shocked me and made me realize that owners need to really be careful how many and what treats are being given to their pets. Just like cats, overweight dogs can also be prone to osteoarthritis, heart conditions and diabetes. Jake loves playing in the snow! If you are having trouble exercising your pet in the winter, suggestions would include hiring a neighborhood person to walk your dog or consider taking up a winter sport like cross country skiing or snowshoeing. 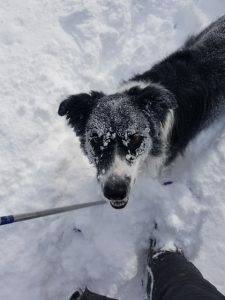 I am an avid snowshoer and enjoy taking my dogs with me on the trails. This is excellent exercise for me and my dogs during this time of year. Other options would include enrolling your dog in a doggy daycare if they enjoy playing with other dogs. Just make sure you are taking them to a reputable place and that their vaccines are up to date. Laser lights are another easy way to exercise your cat or your dog. These are inexpensive and can provide hours of entertainment! Exercise is so important for dogs. It also can eliminate many behavioral problems like destructive chewing, hyperactivity, anxiety, play biting, and attention behaviors like barking. My Border Collie Jake has endless energy. Every day we either have to hike, snowshoe, or play fetch. If he doesn’t have his daily exercise, he will act out and take his frustrations out on the other dogs in the house. Exercise is not only important for the body but also the brain. It helps keep me and my pets feeling good all year long!